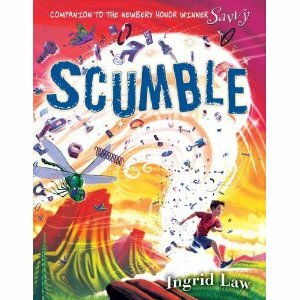 Scumble is the second book by Ingrid law about a family that has a secret. they each get their "savvy", kid of like a secret power when they turn thirteen. Like all of Ledger (Ledge) Kalis' relatives before him it takes a little time to get his savvy under control. He feels bad about his power because it destroys human objects. These objects can range from something as simple as his father's nose hair trimmers to a motorcycle. Traveling cross-country with his parents to attend his cousin's wedding played havoc with the vehicle. Disastrous things happen at the wedding. Because of this he is placed away form others until he can "scumble", learn to control, his savvy. Add to this predicament, cousins who torment him while pretending to help him, and an outsider who has learned about his family's savvies and her father who wants to take over his uncle's ranch. The fun never ends. The secondary characters are all charming and leave an open door for more books about this unique family. Like her first book "Savvy", Ingrid Law has created a fantastic journey that every child dream of taking.